Don’t stop believing, you’ve got the music in you. For music lovers and aspiring musicians, these wonderful music apps must not be missed! It’s slim, it’s sleek, it’s black and now it is also a companion in my music practice. The new Dell Venue 8 helps musicians carry this compact little device anywhere to Riyaaz or practice sessions. 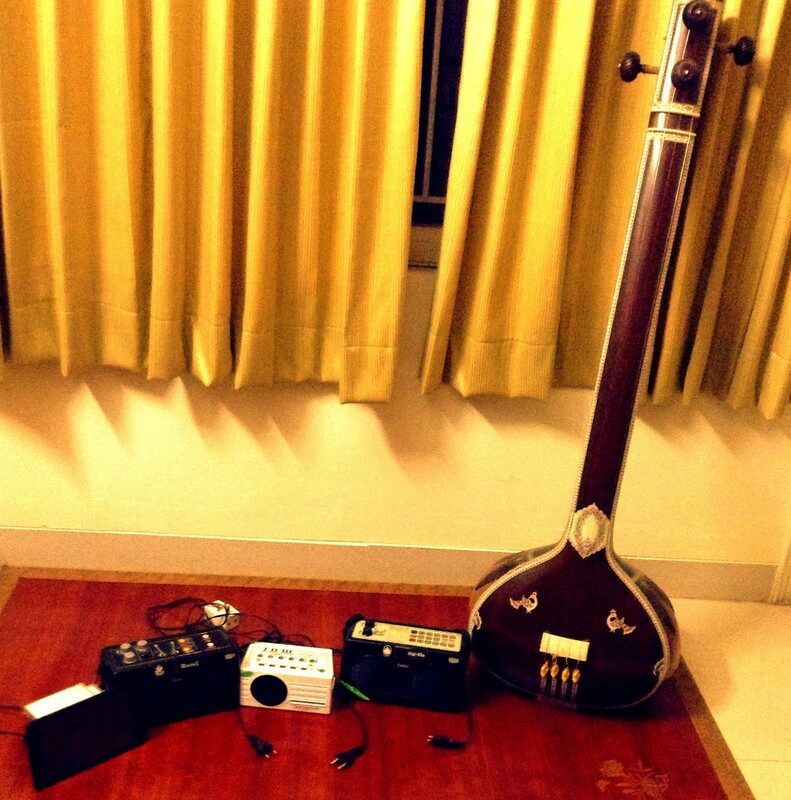 The electronic Tanpura, which came by in the year 1979 eased the complexity of managing and transporting Tanpuras to live concerts and practice rooms. The Sruthi-box was literally in the shape of a box; it was light and small and would fit into an average bag. It tried to ease up the work involved in maintaining and carrying the big pumpkin shaped wooden Tanpuras. As technology kept evolving, by the year 2000, we became a little lazier. We had new sleek alternatives to the music box too. And now smart phones and tabs, resonate with the sound of an original instrument! The sleek Dell Venue tab is all your instruments rolled into one! In short, my black Dell Venue tablet is like a break away from tradition. It gives me the freedom to sing anywhere, anytime. I usually love singing on my terrace. And all I have to do is take this compact device along with me, and be assured of an accurate scale to sing along. Though nothing can replace the poise and sound of the real instrument, the Tanpura Droid app, easily available online, gives you a near-real experience. If you are an aspiring artist or a performer or even a wannabe singer there is no better app available than this, to improve your singing and take it to the next level. In the same way there are many apps available for the Taal or beat practice too. The Taalmala, which resembles the Sruthi box and is very similar in operations, has been any singer’s accompaniment from a long time. Ideally, for practice, one needed two boxes, which now have been replaced by one sleek Tab. The Dell Venue supports singers and practitioners to share our passion with the world. You could be anyone, an ardent music lover or a bathroom singer or a wannabe sitar player. Download any recorder app using your tab and record your voice or instrument. Upload it on a platform like SoundCloud, and you are all set to create your own following. There will be likes and feedbacks for your music and a whole new world may open up as a possibility. Apart from all this, the Venue is great to generally listen to music and have favorite playlists at your fingertips. I found the following apps available on the Dell Venue for free. Hope you find them useful. The Droid and Tabla on my Venue, gives me the freedom to do my riyaaz anywhere. Take your practice to your roof, basement, garden, or anywhere you want to. It has never been this easy to find classical music of your choice. Both Hindustani and Carnatic classical music genres are available here. The app has a lot of music to offer – you get Thumris, Ragas, Krithis, at a very nominal charge, though the app developers need to work more on the navigation of pages. Try this on your tab, it’s a genuine find. This one is especially for singers wanting to tune their instruments. It is quite accurate with a clock-like meter pointing to musical notes. If not for music, it’s an interesting app to have to check at what scale you talk and what is the pitch you most frequently shout in! All the Hindustani Classical music students can please stand up and notice this app. Though the developers must improve the demo music tone, it is a good app for quick reference on about 100 Raags. It’s a basic app referring to ‘aaroha’, ‘avaroha’ and ‘pakads’. The good thing is it also shows movie songs based on those raags. Listening to music is a very important part if you are learning music. A good wi-fi connection is all you need to listen to Wellness music, Indian Folk, Raagas, Fusion, Spiritual Songs, Sufi and Ghazals and Bollywood. Have you heard the Aman Ki Asha song by Shankar Mahadevan and Rahat Fateh Ali Khan? No? Listen here. I loved this app! Use your Dell Tab for a lot more than playing game apps. There is a world out there for the musical ear and throat.